Is your school’s website making the grade? When it comes to educational websites, a school’s needs are a little different than the average business. While an attractive design is certainly important, bulletproof functionality and ease of use is where it’s really at. A strong educational website should be informative, well-organized, easy to update, and perfectly functional on devices of every size, shape and flavor. It should also reflect the school’s overall “vibe,” providing prospective parents and students with an idea of the educational environment and giving current parents and students a sense of pride. A school’s website is often its online heart – it’s the constantly updating day-to-day bulletin, it’s the event calendar, it’s the central repository of information. We understand these needs, and we’re here to help you build a website for your school that is clean, attractive and functional. Most importantly, your site will be well organized and easy to use for both site administrators and the end user. Viva Design Studio acts as the hub of a network of trusted digital marketing professionals that can create a polished, professional and functional digital presence for your school. We’ll act as the coordinator for your marketing efforts, and you’ll work directly with our associates for these additional services. Your brand tells your customers who you are, what you are about, and how you are different than your competitors. Stand out with unique, consistent branding all your own that makes your business memorable. Teachers and school administrators already have full-time jobs – and then some. Maintaining an effective online presence for your school can be an overwhelming addition to the day-to-day workload. Whether you need regular marketing assistance, occasional help, or just basic social media training for teaching and administrative staff, Adam has got your back. He’ll ensure that you have all the tools you need for success. Need new features, content or technology updates, or regular software updates and security upgrades? Josh will help lighten your load and keep your website looking state-of-the-art. Strong, detailed product descriptions establish credibility with your customers and help Google give you the ranking you deserve. Let Karen help you create custom product copy that will make your website a sales machine. The Windsor Schools are New Jersey state-approved, nonprofit, private schools for students who exhibit learning, behavioral and attention disorders and require a therapeutic environment to address their social, emotional, behavior and academic needs. We were initially approached by Windsor Bergen Academy, a K-8 school in Ridgewood, NJ. We built a site for WBA that was colorful and upbeat, reflecting their mission of helping their students achieve success. In addition to information about WBA’s academics and special services, its preschool program, and its enrollment process, their site features an events calendar and cafeteria menus to give parents and students access to current information. 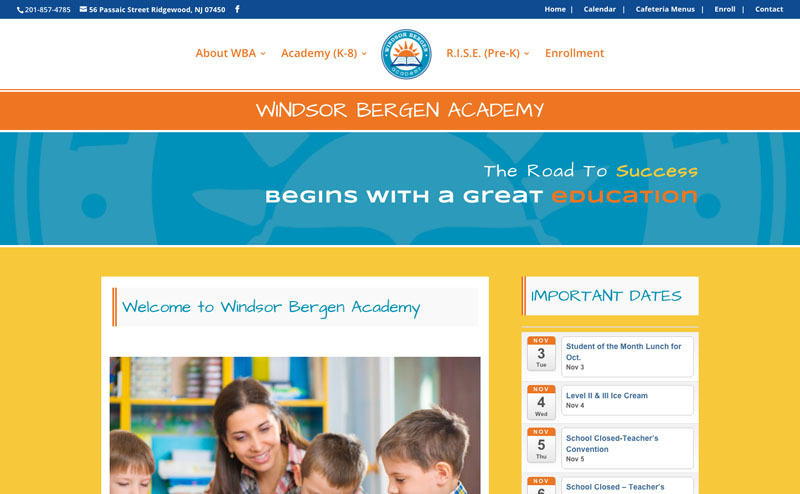 The school was so happy with the site that we were later approached by Windsor Prep High School, in Paramus, NJ. Windsor Prep continues WBA’s mission with older students, preparing them for life after high school. We created a companion site for Windsor Prep that mirrored the overall structure of the Windsor Bergen site, with the addition of student and staff portals, as well as a “Counselor’s Corner” blog. Graduate to the next level with a new school website.